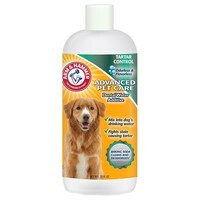 Arm & Hammer Dental Water Additive for Dogs is a water additive that fights tartar and combats bad breath everytime your dog takes a drink. Virtually odourless and tasteless, the Dental Water Additive has been formulated with baking soda which penetrates the microscopic crevices on the teeths surface for maximum cleaning. Simply add to your dog's drinking water to control tartar and freshen breath for up to 24 hours. ordered on 2nd June 2018 and this arrived 8th June 2018, very well packed, very happy. This stuff is brilliant! I used to buy the tropiclean water additive and it is very good but I had noticed that my 12 year old Jack Russell's breath had started to smell again and it was working out expensive so I changed to this to see if it would help. 3 days after starting it her breath had improved greatly and after a week no smell at all. Her teeth are clean and white and its lasting for ages (two dogs, bought in June, halfway down the bottle September) as you only put one cap full in per bowl.